Any time that a person sets out to quote a part of the Bible, it is important to look both backward and forward in scripture to insure that one isn't taking the meaning of that portion out of context. In many cases that involves going back a considerable distance, and in fact may leave you feeling like you should quote the entire book to be sure you don't miss some of the context. In the case of this post, I initially wanted to concentrate on Titus 3:3, but upon reading both the verses before and after, I decided to expand the text that I will concentrate on to Titus 3:1-7. "But speak thou the things which become sound doctrine:"
The rest of chapter 2 and on into our text in chapter 3 are things that "become" or "fit with," or "are in alignment with" sound doctrine. Now, to our text. Titus 3:1-3 Remind them to be submissive to rulers and authorities, to be obedient, to be ready for every good work, to speak evil of no one, to avoid quarreling, to be gentle, and to show perfect courtesy toward all people. For we ourselves were once foolish, disobedient, led astray, slaves to various passions and pleasures, passing our days in malice and envy, hated by others and hating one another. If you follow the news at all, you are probably aware of the abundance of anger and hatred there is in our nation today. Recently there have been a number of shootings involving the police and members of minority groups. In two of these shootings the person from the minority group was killed, and it is quite possible that one of those was a incident where a police officer made a deadly mistake whether it was out of malice or fear. The third incident was a case of a member of a minority group taking revenge for those earlier incidents by shooting and killing a number of police officers. "For we ourselves also were sometimes foolish, disobedient, deceived, serving divers lusts and pleasures, living in malice and envy, hateful, and hating one another." The English Standard Version says it like this: "hated by others and hating one another." Perhaps some of you have been Christians for so many years that you really don't remember what it was like to fit that description; hateful and hating one another. As for myself, having only been a Christian for about 16 years, I can very well recall when I was full of hate and hating others. There is no doubt in my mind that I would have been full of hate over these killings. In fact, given my background as a biker, I can testify that I would have been in the odd position of hating the minority groups for their skin color and hating the police for their position of authority! In fact, I find the entirety of verse 3 to be an apt description of myself before Jesus became my Lord and Savior. I might have to amend the "sometimes foolish" to read "most times foolish", but the "deceived, serving divers lusts and pleasures, living in malice and envy, hateful, and hating one another" are an all too perfect match. Our nation presently is plagued with exactly these symptoms that Paul described to Titus here in verse 3. In fact, it could serve as a checklist for the culture of America today. Sometimes foolish. Check. Deceived; not only by false religions, but also by false versions of the Gospel. Check. Serving, or as the ESV puts it, slaves to various passions and pleasures. A big check mark there. Living in malice and envy. As Americans nearly all of us have more wealth than most of the people who have ever lived, and yet we still envy every one who has just a little bit more and have malice in our hearts toward them because of it. Check. Hateful and hating one another. We see it every day. Check. "Put them in mind to be subject to principalities and powers, to obey magistrates, to be ready to every good work, To speak evil of no man, to be no brawlers, but gentle, shewing all meekness unto all men." But perhaps even more importantly, Paul goes on after verse 3 to remind Christians the reason why they were no longer be foolish, disobedient, deceived, hateful, and hating one another. And what he says there also happens to be the remedy for any who have never trusted Jesus as Lord and Savior. Titus 3:4-7 But when the goodness and loving kindness of God our Savior appeared, he saved us, not because of works done by us in righteousness, but according to his own mercy, by the washing of regeneration and renewal of the Holy Spirit, whom he poured out on us richly through Jesus Christ our Savior, so that being justified by his grace we might become heirs according to the hope of eternal life. The remedy for all the hate is love. But real love for your fellow man is a result of love for God, and that happens because of the kindness and love of God our Savior. As this passage tells us, that comes about not by our works of righteousness, or good works as we often call them, but solely by God's mercy in which he cleanses our sins by way of the new birth, the washing of regeneration as its called here. If you have never done so, God's command remains for you to repent and believe the good news that Christ died for your sins, and that he rose again the third day. Then as our text says, you will be justified by his grace. The eternal life that follows? That's just the frosting on the cake. The 2016 edition of the Meltdown Drags are now history. Great racing action, good friends, and cooperative weather - who could ask for anything more? 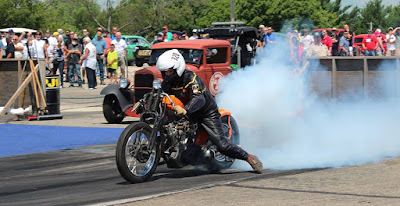 Well, I guess Wayne Skinner could have asked for a few more passes on the lower end of his Triumph before finding bearing material in his oil after his last run on Friday. Still, even he enjoyed the atmosphere despite his bike's nitro methane induced early demise. After several years of largely self inflicted frustration, I finally got the Knuckledragger to perform near its potential. These things tend to take time when you limit your racing to one weekend per year. Of course many of the other racers are likewise still sorting out fresh builds and/or modifications. Even with the old stuff, there is really no such thing as the "status quo." 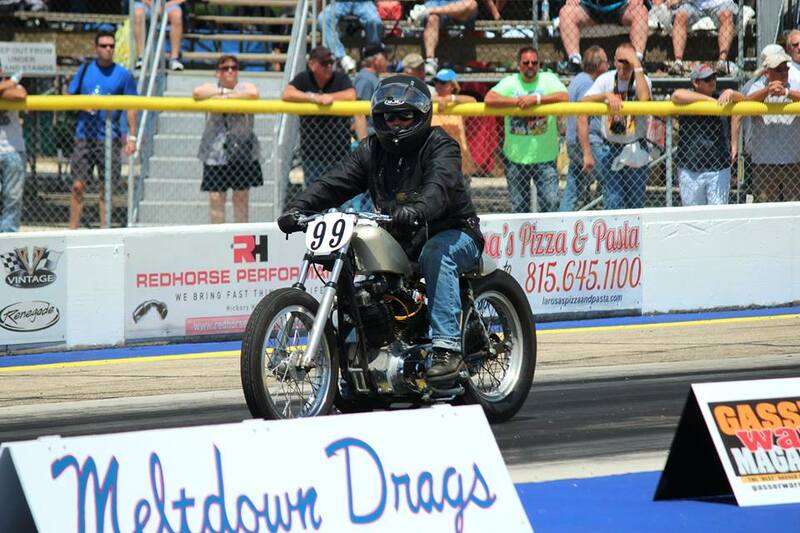 The number of drag bikes was down this year, primarily due the conspicuous absence of the AH Garage racing team. (c'mon guys, it's just not quite the same event without your stable of horses joining in the fun) It was the first time Skinner has been able to make it to the Meltdown, but he is pretty confident it won't be the last. 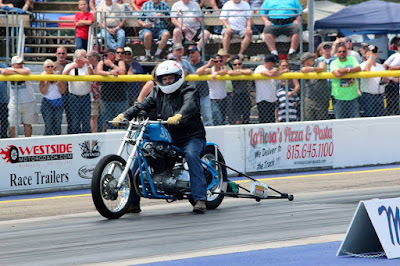 There was also a first time (I think) appearance by Robert Nieves, another Iron Head racer, who also had a really sweet Hemi powered dragster (of the 4 wheel variety) on hand. Self centered jerk that I am, I never got over to meet him and welcome him to the group, but I know Skinner and others did. Other than that the motorcycles were represented by most of the usual suspects. The remaining pictures were all taken by Car Show Aaron, who seems to really have a knack with the camera. 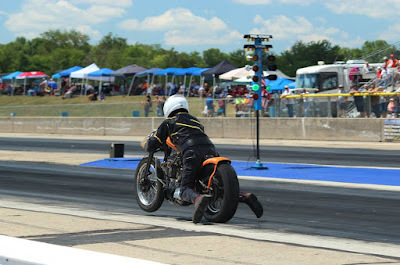 His Facebook page contains some really great shots of not only the bikes in attendance, but a large number of the drag cars that make the Meltdown such a success (over 160 photos). If you share his pics, please give him credit for them. That caption probably needs an explanation, since I just now made up that nickname for Jay. 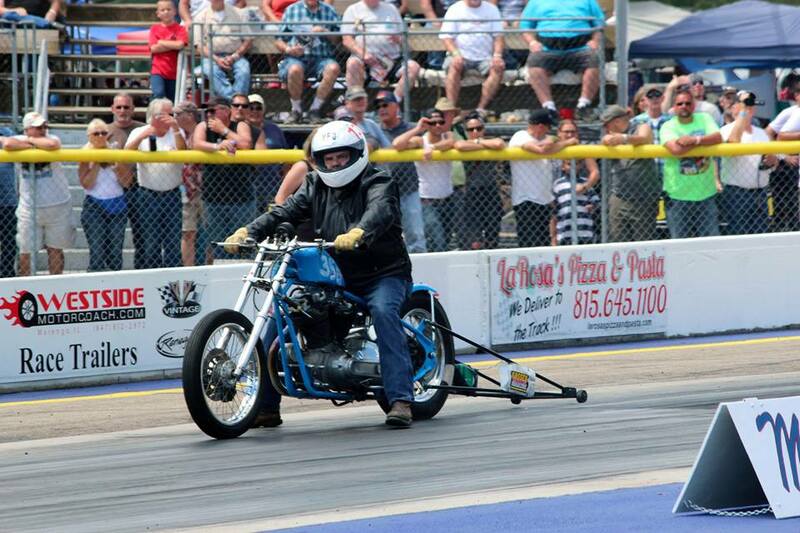 It seems that every year "Gasser Wars" magazine features a picture of Jay in their coverage of the Meltdown Drags. A year or so ago they had a picture of Jay and his Sporty as their "favorite bike" pick. 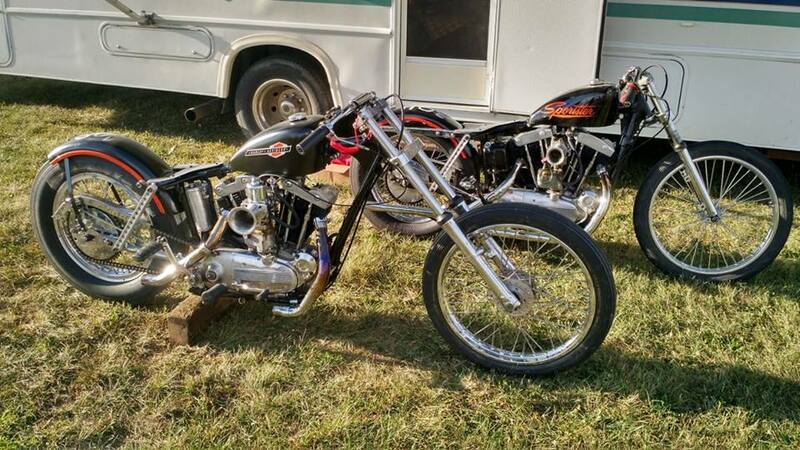 This year there he was again next to a line of text extolling the vintage drag bikes as real crowd pleasers. "Famous Jay" - just kind of rolls off the tongue, don't you think? As mentioned, the Knuckledragger finally made a pass near its potential (though one could argue that the bike itself has been chomping at the bit for two years with only the rider holding it back). That happened early Saturday afternoon with Famous Jay in the other lane. Nothing like being lined up next to a fast bike to add some incentive, resulting in the best E.T. 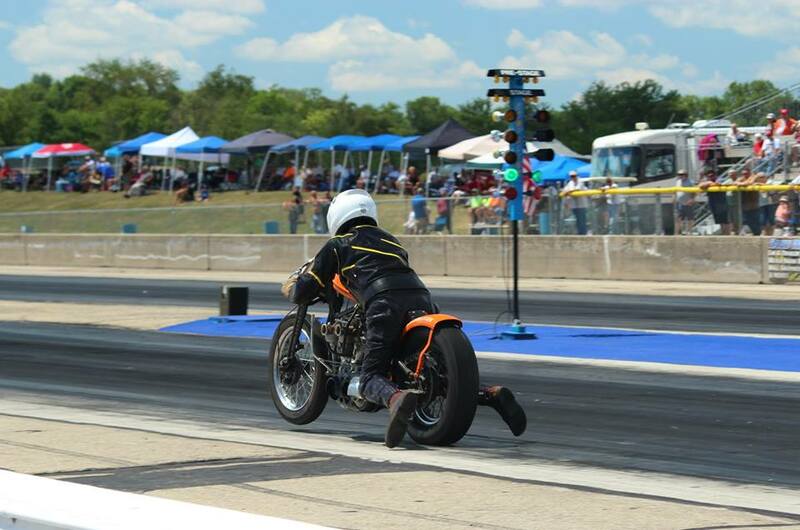 and MPH for the hand shift Knuck to date: 12.056 seconds @ 113.32 MPH. If you have a vintage drag bike, today is the day to start working on it so you will be ready to join in the fun next year at the Meltdown Drags.